Yeah, actually, I did. People have been reporting them all over. Not a lot of them, just 1s and 2s in the appropriate brushy stream-side habitat. 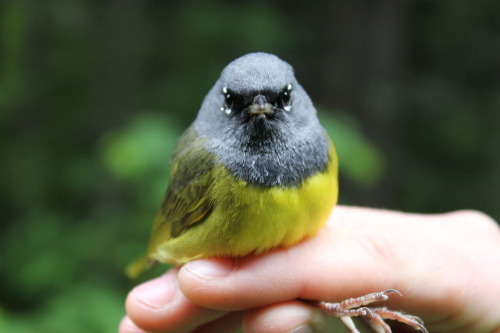 I’ve been looking, sifting through lots of Common Yellowthroats and Wilson’s Warblers, but so far no luck. Anyway, I headed to the 8th Street bridge where Eric had just seen three of them, and shortly thereafter he refound one of them for me. Thanks Eric! Tags: carp without cars, birds, santa barbara county year list, pjh, mgwa, mine was significantly less grumpy-looking, prolly b/c he hadn't been mist-netted and held for banding. This entry was posted on Friday, May 4th, 2018 at 3:31 pm	and is filed under Tumblr reblogs. You can follow any responses to this entry through the RSS 2.0 feed. You can leave a response, or trackback from your own site.